This sleeping bag, intended primarily for expeditions, will be your faithful companion in the harshest conditions,” advises Antoine, product manager. “In lab tests, its comfort limit was -16°C based on the latest standards. But we know from expedition feedback that the WORLDROOF stays comfortable in far more intense cold.” The causes? Ultra-high-quality goose down that fills the top section of the bag, plus DOWNTEK™-treated duck down which fills the rest – bottom section, foot and head. Naturally, down stops insulating once it’s wet, but DOWNTEK™ technology works round the problem: once treated, the down has excellent hydrophobic properties, so it keeps all its thermal capacity. We like the dimensions of this bag, which has a specific shape designed for expeditions: it’s longer, so you can sleep fully-clothed and keep gear dry and warm at your feet. Did you know? 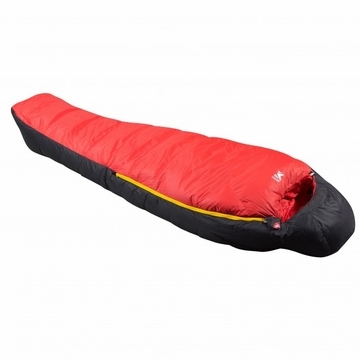 There are 3 types of insulation for sleeping bags: down, synthetic and composite. Down offers an unrivaled lightness-to-warmth ratio: weight for weight, it provides most heat; and though highly compactable, down regains its volume. In the insulation game, volume is key. ""Loft traps most air."" And that's good, because air is what protects us from the cold!